You know that when you pick up a book edited by Ellen Datlow you’re bound to get some really nice fiction. This volume is no exception. Haunted Nights is a collection of short stories with a Halloween theme. That’s a pretty narrow window for reading on a theme (it’s not like Christmas when people typically begin around Halloween) but fortunately the horror story genre doesn’t confine itself to Halloween. Although I think it’s true that you can be pretty confident about your selection when you pick up a book by Datlow, I’ve also found that I’m rarely ‘wow’ed by any one particular story or stories. A lot of them a good to very good but nothing spectacular. That holds true here as well. Every year, there are a few days when the border between the natural and the supernatural worlds gets less solid, less real, less … there, and nobody knows why. I once overheard a woman who’d just been to a funeral say something to the effect that the dead person’s troubles were over. I didn’t even have to look at her to know she lived only in the natural world. I definitely need to read more Pat Cadigan. I also enjoyed John Langan’s “Lost in the Dark” and John R; Little’s “The First Lunar Halloween”. The latter of course not being set on earth was clever and fun. Langan’s story rises to a different level as it is a horror story about horror films. I had expected to fall in love with Seanan McGuire’s story as I relish her novels, but this time I wasn’t as moved by her work. Looking for a good book? 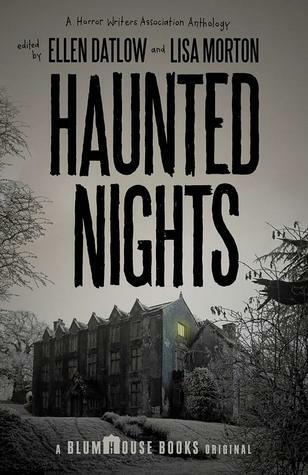 Haunted Nights is a collection of Halloween themed short stories edited by Ellen Datlow and Lisa Morton and will give you shivers any time of year.